Polikarpov I-16. Los moscas atacan! 1. I-16 type 5. 4th A.Sq. Pilots Morales and Sarausa flew the plane. 1938. Coloring - standard. Engine jacket of the plane - black. On wings from above and from below - red strips. 2. I-16 type 5. Coloring standard. Engine jacket of the machine-black. On wings-red strips. I-16 type 10. Coloring standard. Spinner of propeller - silvery. Consoles of wings - red. 3. I-16 type 10 of 26-th group 1944-45. Coloring of the plane - completely green. Spinner of the propeller -red. Identification marks from above and from below of wings. 4. I-16 type 5. The pilot - American volunteer Franc Tincker. Summer 1937. Coloring of the plane standard. Consoles of wings - red. 5. I-16 type 10. 5th A.Sq. 1938. 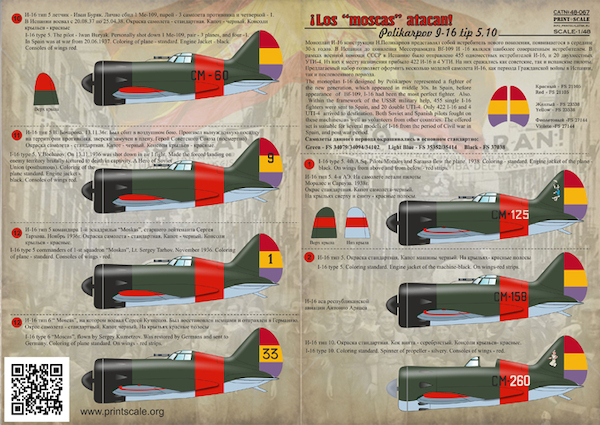 Coloring of the plane standard. Engine jacket - black. 6. I-16 type 5, was delivered to repair shops 1936 (?) Onboard inscription - "Do not touch". Coloring of the plane standard. Engine jacket - black. 7. An I-16 type 5 of group I. Eremenko. May-Junne 1937. Before rearmament to I-15 the pilots of this group covered Kartakhena. Coloring - standard. On wings -red strips. 8. I-16, after war it got in hands of Frankoists and was includes into air group 1W. Airfield in Quatro - Vientos in 1939. A background of the plane sand-earthen, FS 30118. Stains on all background - brown earthen and green. A bottom of the plane light-blue, FS 35352. 9. I-16, got after war in hands of Frankoust, they used if for demonstration flights. Coloring of plane: background white, bottom planes -yellow. 10. I-16 type 5. The pilot - Iwan Buryak. Personally shot down 1 Me-109, pair - 3 planes, and four -1. In Spain was at war from 20.06.1937. Coloring of plane - standard. Engine Jacket - black. Consoles of wings red. 11. I-16 type 5. V.Bocharov. On 13.11.1936 was shot down in air I fight. Made the forced landing on enemy territory brutally tortured to death in captivity. A Hero of Soviet Union (posthumous). Coloring of the plane standard. Engine jacket - black. Consoles of wings red. 12. I-16 type 5 commanders of 1-st squadron "Moskas", Lt. Sergey Tarhov. November 1936. Coloring of plane - standard. Consoles of wings - red.